SYNTHETIC CIRCUIT: In this example of a typical transducer, the genetic construct (top) includes an amplifier response element and a carefully positioned transcription factor response element upstream of a promoter that drives expression of a fusion gene (the combined effector of choice and an amplifier). In the presence of a specific endogenous transcription factor, which binds to the transcription factor response element, the fusion gene is expressed. 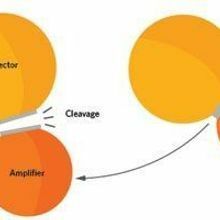 Cleavage of the fusion protein releases the amplifier, which together with the transcription factor drives much stronger expression. The system is like a positive feedback loop, but neither the transcription factor nor the amplifier alone can drive strong expression—they need each other. Some synthetic biology applications use cells as mere hosts for engineered genetic circuits—for example, when cells act as factories for desired molecules. For other applications, however, researchers would like to integrate the synthetic circuits with the cell’s own pathways. Such integrated systems could be used to sense particular molecules and induce appropriate responses. For instance, detection of a metastasis-inducing protein in a cancer cell might be used to trigger that cell’s suicide. 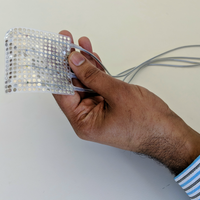 “The concept is that these synthetic circuits will be able to read out bits and pieces of information from the cell and interpret them to make decisions and drive the cell in different directions,” says Yaakov “Kobi” Benenson of the Federal Institute of Technology, or ETH, in Zurich. Benenson and colleagues have recently generated genetic constructs—or “transducers”—that can detect the presence of specific transcription factors in human cells and, in response, activate synthetic processes—such as the expression of particular proteins, the silencing of mRNAs (via microRNA production), or the induction of targeted genetic recombination. 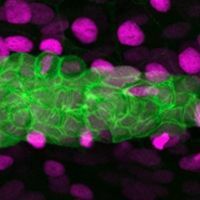 The constructs are similar to tissue-specific expression vectors, in which promoters with cell type–specific activity are used to drive transcription of a desired gene or genes. The difference, however, is in the constructs’ precision design and ability to detect cell states, not just cell types, says Benenson. Having established key design principles, the team was able to create transducers that detect a variety of different transcription factors. In one scenario, for example, detection of the developmental transcription factor Sox10 drove Cre recombinase activity and, in turn, the recombination-dependent expression of a fluorescent reporter. 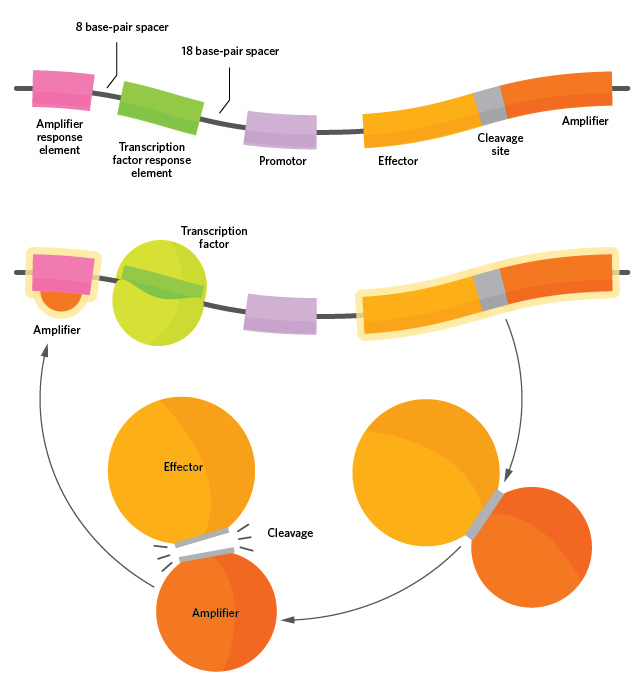 the presence of one or more specific transcription factors. be turned on during discrete cell states, including transient conditions.